As with many students of the field of palaeontology, my passion started when I was a young boy. I left my hometown Hannover after highschool graduation to study the B.Sc. Geosciences degree at the Ludwig-Maximilians-University in Munich, because it had a major palaeontological component. During my Bachelor, I studied a semester abroad at the University of Utah. I collected field work experience in several campaigns in the U.S., Germany, and China. After my Bachelor’s, I stayed in Munich and I am currently finishing up my Master’s degree. I am interested in tetrapod evolution, and want to understand how extinct organisms have lived and functioned. To approach these questions, I am trying to acquire profound knowledge of anatomy at this early stage of my career. Anatomical expertise is crucial to conduct phylogenetic research and to understand the physiology of organisms. To examine single bones in more detail, I like making scientific drawings, some of which will hopefully soon complement some papers of ours. I am interested how phylogenetic information can be utilized to detect evolutionary patterns, such as radiations, or functional adaptations. I like the interdisciplinary spirit in the professional field of palaeontology, and appreciate the use of CT-technology for paleontological research. In the future, I would like to combine extant physiological or molecular data with insights from fossils, and learn more methods to approach evolutionary questions. I would also like to integrate my geological background in future research, for example in ecosystem reconstructions. For my Bachelor thesis, supervised by Dr. Oliver Rauhut, I described specimens of the enigmatic theropod dinosaur Sigilmassasaurus from the ‘middle’ Cretaceous of Morocco. I have presented preliminary results of this study with several posters and talks, e.g. at SVP and the PalGes meeting. The project includes co-workers from Britain and Canada. Currently, our team is writing up the manuscript for publication. 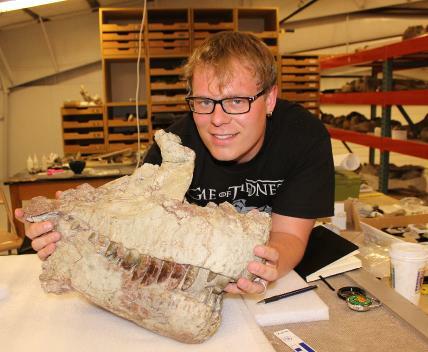 Also, I am working on a statistical evaluation of the taphonomy of the Cleveland-Lloyd Dinosaur Quarry in Utah, a project I started with Randall Irmis and Mark Loewen during my time in Utah. For my Master thesis, I currently describe the postcranial skeleton of Big Al 2, a large Allosaurus specimen from Wyoming which is housed in the Sauriermuseum in Aathal. Together with Christian Foth and Oliver Rauhut we are also describing the head skeleton. Another piece within this larger project is the documentation of the pathologies of the animal, on which I presented a poster together with Christian Foth, Oliver Rauhut, Octávio Mateus, and Ben Pabst.